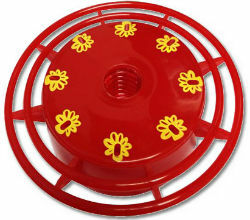 Replacement red ABS Plastic base (non-metallic) Full ring perch with 8 feeding stations. Fits all Humdinger brand hummingbird feeders. Base can also be used with any 28 mm bottle, 2 litter soft drink bottle.